4 USB 3.0 ports. 6 USB 2.0 Ports. 5 PCI express slots. 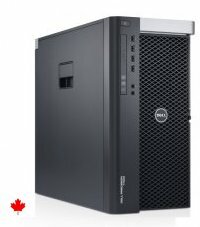 Precision Workstation T7810 is a high end solution designed for complex computing environments that require outstanding performance, expandability and capacity. Dual E5 Xeon architecture, 8 Cores - 16 Threads, built for Graphics, CAD/CAM, Gaming, and Industrial applications. Powerful Factory Turbo up to 3.50Ghz, USB 3.0.